Ellon Cinema volunteers will be running a very special night on Friday (see below) as this will be their first Opera event and are hoping that it will prove popular. They are planning to offer a seating at table option and a licenced bar for both pre and half time refreshment. Online bookings are already coming in and they will be offering the usual pay at the door option for those who make up their minds last minute. If successful, Ellon Cinema will be looking at putting more from the All Opera 17/18 series (which includes a ballet) during 2018. 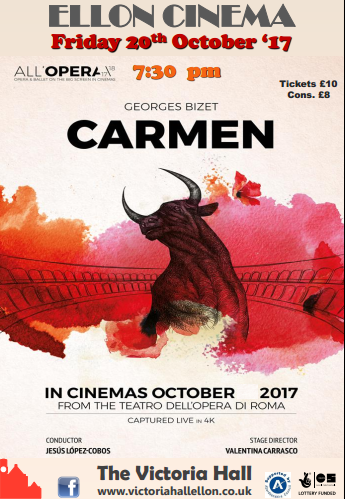 Georges Bizet’s Opera CARMEN – 7 pm for 7:30 – Staged by Argentine director Valentina Carrasco, this is a modern interpretation performed in the enchanting setting of the Terme di Caracalla in Rome, the archaeological site of the Roman Baths where a unique theatrical stage comes to life. Captured live in HD from their summer programme this is an encore version intended especially for showing in theatres and cinemas world wide. Goodbye Christopher Robin (12A) – Provides a rare glimpse into the relationship between beloved children’s author A. A. Milne (Domhnall Gleeson) and his son Christopher Robin, whose toys inspired the magical world of Winnie the Pooh. Along with his mother Daphne (Margot Robbie), and his nanny Olive (Kelly Macdonald), Christopher Robin and his family are swept up in the international success of the books; the enchanting tales bringing hope and comfort to England after the First World War. But with the eyes of the world on Christopher Robin, what will the cost be to the family?.